FALL RIVER, MA--(Marketwire - Feb 26, 2013) - Rex-Cut Abrasives manufactures a full line of cotton fiber quick change discs that are ideal for removing small welds and machine tool marks, edge breaking, and related finishing tasks. Rex-Cut Cotton Fiber Quick Change Discs are rigid enough to reach into small corners, yet flexible for use on flat and contoured surfaces to remove small welds and break edges. Constantly revealing fresh abrasives as they work, they are made from multiple layers of reinforced non-woven cotton which are impregnated with abrasive grains and then pressed and bonded together and fitted with Type R and Type S style fasteners. Capable of grinding and finishing in one step, Rex-Cut Cotton Fiber Quick Change Discs provide smooth, controlled grinding action with no smearing on titanium and stainless steel and are non-loading on aluminum, Kevlar®, and other composites. 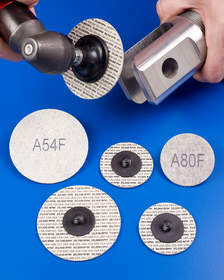 Designed for use with right angle grinders, these quick change discs are available in 2" and 3" sizes with aluminum oxide and silicon carbide abrasives, in seven different grain sizes and three different bonds. Rex-Cut Cotton Fiber Quick Change Discs are priced according to size and quantity. Free samples and price quotations are available upon request. Rex-Cut Abrasives is the oldest manufacturer of cotton fiber abrasive grinding and finishing products in the world. Since the early 1920s, they have been manufacturing a non-woven cotton fabric that is impregnated with abrasive grit and then pressed and formed into various shapes. These specialty abrasive products constantly reveal fresh abrasives as they work and typically reduce finishing steps in all types of industrial and architectural welding and metal fabrication applications. In 2008, Rex-Cut became 100% employee-owned, a loyal and experienced team who has a true interest in the continued success of the company. Rex-Cut offers a broad line of reinforced nonwoven cotton fiber abrasive products for a wide range of grinding, deburring, blending, and finishing operations on stainless steel, exotic alloys, aluminum other metals, fiberglass and certain composites. Rex-Cut Cotton Fiber Quick Change Discs are rigid enough to reach into small corners, yet flexible for use on flat and contoured surfaces to remove small welds and break edges.